Brett Favre talks with the media after his first practice with the Minnesota Vikings on August 18, 2009 at Winter Park in Eden Prairie, Minnesota. For all of the negative publicity produced by Brett Favre’s latest retirement flip-flop, fans have flocked to watch him in action — and buy his memorabilia. 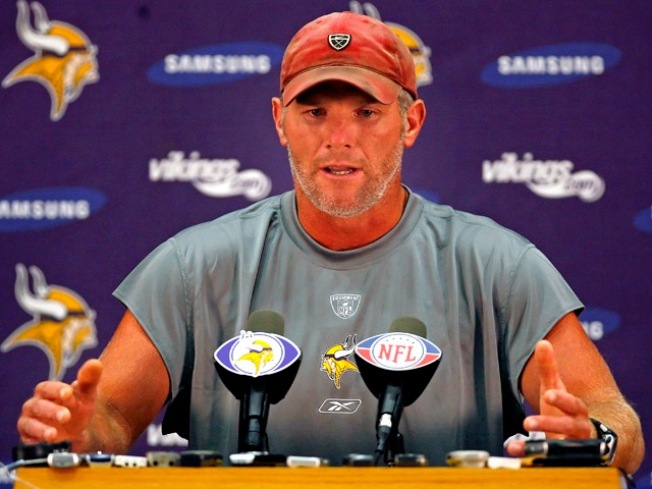 Over just a 10-day span following his arrival in Minnesota, Favre’s No. 4 Vikings jersey — still a strange sight — was the top seller on the NFL’s merchandise Web site for the entire sales period from April 1-Aug. 28. It costs $80. Newness always helps: Jay Cutler ranked second and Michael Vick was fourth during that timeframe. The Favre phenomenon, however, seems like it’s just one of a kind. Perhaps the only person surprised to hear about Favre’s jersey-selling success was his most prominent Vikings teammate. So, Peterson was asked, have you gotten one for yourself? “I’ve been scared to sit here and ask him for one,” he said, smiling. Peterson shook his head as he recalled the mother of a high school friend approaching him after a recent game in Houston to ask him if he could get Favre to autograph a jersey for her. Favre was also asked Wednesday if he had considered acquiring one of these items for himself. On the football side, Favre has brought stability and a record-setting resume to the most important position on Minnesota’s offense. Off the field, the wow factor of having Favre on the team has helped take some of the attention away from the other stars such as Peterson. It has alleviated some of the interview requests from reporters, too. “Now it’s not all on me, so that’s cool,” Peterson said. The Vikings aren’t among the top 10 selling teams on NFLShop.com, one sign of how popular Favre truly is. Troy Polamalu and Ben Roethlisberger of the Super Bowl champion Pittsburgh Steelers ranked third and fifth, respectively, on the April-August jersey list. Success sells, as does a storied franchise. Favre, Cutler and Vick have been popular buys because of the novelty, but they each come with some controversy. Vick was jailed and suspended by the league for his role in a dogfighting ring before recently signing with Philadelphia. On a smaller scale of negative public relations, Cutler unhappily forced his way out of Denver and was traded to Chicago. And Favre has frustrated fans — not to mention alienated many loyalist supporters of his old team in Green Bay — with his indecision. The polarization factor, said sports marketer Matt Delzell, has actually been a boon for Favre. “Now that he’s got some ’haters’ the people who do like him are especially more likely to go out and buy his jerseys,” Delzell said in an interview from his Dallas-area office. He works for entertainment marketing agency Davie Brown. Favre will likely always be a major generator of buzz. Stephen Ross, a sport management professor at the University of Minnesota, echoed that theory.